I admit it. I used to have an addiction problem. It caused a lot of stress in my life. It was a heavy burden. Sometimes it got so bad that I had to pay people to help me get from one place to the next. I could barely get up the stairs by myself. I even missed some airplane flights because of it. No matter where I went, I had to consider how I was going to deal with my personal baggage. Now, when I try to discuss the subject with someone who has this addiction, they get visibly upset. They protest. They cry that they can't change. Some get angry and won't listen. Others beg me to help them. Maybe you are one of these people. My name is Annie and I was an Over Packer. Whenever I went on a trip, I packed a large suitcase so full I had to sit on it to zip it shut. I couldn't help myself. I was addicted to Over Packing. Do you pack clothes that you wear once or maybe not at all? Do you bring shoes and purses that only go with one or two outfits? Do you bring enough toiletries to last you six months on a desert island? Do you add toiletries you use only occasionally "just in case" you MIGHT need them? Do you spend an extra hour waiting for your luggage, instead of getting off the plane and going directly to your destination? Have you ever had to deal with the nightmare of lost luggage? Are you limited to staying in hotels that have bellmen and elevators because you can't easily carry all of your stuff yourself? If your plane were canceled or delayed, would you have to wait for your luggage to be taken off before you could catch the next plane? If your plane arrived late, would you miss your tight connection because you would have to wait for your luggage? Are you faced with paying excess charges for checked baggage on some airlines? Have you ever had to lift your huge suitcase on to a European train and then find a place to put it? Would you have to eliminate a cool place like Cinque Terre, Italy from your itinerary because you can't haul your luggage up six floors of steep, narrow stairs? If the taxi didn't show up on time at your hotel to take you to the airport, could you easily walk a few blocks to the taxi stand or train station with your luggage, or would you miss your plane? Would you panic if I asked you to go to Italy with me for 15 days and you were only allowed one carry on and a tote bag/backpack? Okay, you've tackled the First Step. Step One: You admit you are an Over Packer (OP). Step Two: Make a commitment to the Carry On Only lifestyle. Period. Step Three: Make a fearless inventory of the clothes and shoes you are going to pack. Be tough. Be selective. Only multi-purpose items make the cut. This takes thought, organization, and discipline. At least a week before your departure date, clear out an area of your bedroom or your closet. Put anything and everything you think you might want to take on your trip in this one area. After a while you will notice that many of your things go together and some don't. You'll notice a palette of similar colors emerging. The palette helps determine what works with what. If your favorite purple shirt doesn't seem to go with any of the tan clothes you are collecting, take it out. If you LUV a certain item and really really want to bring it, but it only goes with one other thing, FIGHT THE URGE and JUST SAY NO. I never know what my palette is going to be until I start collecting my clothes. A few years ago I went to France and most of my clothes were black, grey, and white. I added colorful scarves, two pair of stylish but comfortable black shoes and one black purse. On another recent trip, my colors were tan, cream, and brown. I didn't plan it that way, but when I started collecting and eliminating, the palette emerged. Now start making daily outfits out of the clothes in the collection. Try on each whole outfit. What scarf works with the sweater? What shoes work with the pants? If you have pants that are long and you are dying to bring your cute little flats, you either have to hem all of your pants, or leave the flats at home. If you only have one pair of shorter pants, don't bring your flats if they won't work with most of your pants. Trying on each daily outfit is one of my best packing tips. It shows you immediately what works and what doesn't. It helps you select the best accessories that look great with many outfits. And best of all, it saves you so much time on your trip because you know exactly what to wear with what and how it is going to look. I am surprised that most people don't try on their clothes before packing. Step Four: Pack for one week regardless of the length of your trip. This is a difficult concept for some. "But my trip is three weeks!" How can I pack for just one week? Think of your trip as one week, three times, instead of three weeks. When you're at home, do you wear something different every single day for three weeks? No, you probably throw on your favorite jeans several times over a three week period. If you pack clothes you love and are comfortable, and if you have a palette, you will have plenty of outfits to rotate. Here's a tip: Email the hotel where you are going to be a week or ten days into your trip, and ask if they have a laundry service. It is so worth it to give them your laundry in the morning and have nice clean clothes waiting for you when you get back from exploring at the end of the day. If they don't offer the service, look for a laundry mat in the neighborhood. Step Five: Only pack essential toiletries and make up. If you don't require it daily at home, why do you need it on your trip? Love your shampoo? A 3oz travel bottle will last you at least two weeks. If you need anything it is usually no problem to buy cosmetics and toiletries wherever you are. Unless you are going to Siberia, every place you could possibly go has anything you could possibly need. Here's another packing tip......I don't have any fancy cosmetics bags. I put everything in see-through zip lock baggies. Everything I use in the morning goes in one bag, everything I use at night in another. With a sharpie I write a big "AM" or "PM" on the bag. AM things are all the things I use in the shower, plus lotion, moisturizer, toothbrush, toothpaste. PM things are face wash, ear plugs, evening vitamin supplements, night cream. After I use my toothbrush and paste in the morning, I transfer it to the PM bag. Both bags stay in the bathroom. Step Six: Leave your appliances at home. When you are on vacation, do you really need to lug all of your gadgets with you everywhere? Really? Can't live without your laptop? There is computer access in most hotels and usually Internet cafes everywhere. You can also check your email and Skype on an iTouch, a smartphone (make sure the data is off and just use the local wifi for free), or (if you are fortunate) an iPad wherever there is wifi. What about your hair straightener, curling iron, or a hair dryer? You want to look nice, but let's face it...it's not like you are being evaluated for the cover of Town and Country magazine. So what if your curly hair is au naturel? Get over yourself! Email your hotel and ask if they have a hair dryer (I've never stayed anywhere that didn't) and pack a big brush. Step Seven: Find a carry on bag that is 22" x 9" x 14" or less and weighs less than 5 lbs. Take your tape measure with you to the luggage store and measure the bags. Often the dimensions are not correct on the label. And if it says "light weight" don't believe it unless you weigh it yourself. Lift it and imagine it full. Could you hoist it into an overhead bin by yourself? For a large selection of carry on bags from ebags.com., Click Here. Step Eight: Use the "bundling" technique for packing. Forget folding, rolling, plastic bags, vacuuming out air. I learned a technique that miraculously reduces an abundance of clothes into a little bundle, and keeps your clothes virtually wrinkle free. People are absolutely amazed at how many clothes they can get into a tiny suitcase! Bundling involves wrapping your clothes in a specific order around a central core. A detailed description of this technique can be found at a website I highly recommend called OneBag.com. Basically, you start with the longest and widest items, like a straight dress or a raincoat, and you lay them on a bed or the floor in a cross with the neck of each item in the middle of the cross. Each item of clothing is laid out clockwise around the cross until all of your items are lying flat on top of each other in the four arms of the cross. Next, you make the central core. I use a plastic bag with my underwear, scarves, and my toiletries bags. I wrap them in a scarf and place them in the center of the cross. Now the fun begins. You start with one arm of the cross and wrap the item around the core, smoothing it out so that there are no or few wrinkles. Go around the cross in a circle, taking each item one at a time, wrapping each one over the core. When you are done, you have a compact package, or bundle. Just lift the bundle and drop it into your carry on. Your shoes and other items can go where there is room on the sides. For a more thorough explanation of the bundling technique, Click Here. For a diagram of how to lay out your clothes, Click Here. This packing technique is such a good nugget! It sounds complicated but it is really easy. It makes it possible for you to fit sooo many clothes into a small carry on! Believe me, it is worth it to practice this method and teach your travel companions. Step Nine: Make a pledge to yourself that you will limit your purchases when you travel. My parents retired and traveled all over the world. My dad always bought strange shirts that no one would be caught dead wearing after they returned from their trip. No one, except my dad. He wore them proudly to every family gathering, and even to nice restaurants. He loved having his shirts and telling everyone where he got them. Those shirts fit easily into his carry on. The point I'm trying to make is......if you are committed to the benefits of the Carry On Only lifestyle, you must conscientiously look for souvenirs that will give you joy but also fit in your carry on. Step Ten: Travel only with companions who are willing to to abstain from Over Packing. It is frustrating to embrace the Carry On Only experience and then have to travel with an OP. You wait while they stand in line to check their bags. You wait while they collect their luggage at baggage claim. You wait while they fill out forms when their luggage is lost. You wait while they drag their huge bags up stairs and down the street. You listen to them whine when no one is around to help them with their luggage. And it's all for what? So that they can proudly wear something one time and then drag it wherever you go. The first time I traveled to Italy with my friend Ellie, she argued that everything she brought in her big suitcase was a MUST HAVE. She couldn't possibly fit everything she needed into a carry on. Half way through the trip, she realized that she still hadn't worn many of her things. Her toiletries could have been condensed into small bottles, or purchased in the ubiquitous shops. She soon became resentful at having to haul her unnecessary stuff everywhere. Ellie became a member of OPA and pledged to convert to the Carry On Only lifestyle. She has been on several trips since then and loves the freedom from excess baggage. Step Eleven: Continue to look for travel friendly clothes, shoes and luggage even when you don't have a trip planned. Once you experience the freedom from excess baggage, you will begin to be notice how it translates into your daily life. Your favorite clothes will also be perfect for travel. You will buy shoes that are stylish and could be worn sightseeing for hours. You will keep an eye out for a great backpack or tote bag that you can use with your carry on. You won't have to go out and buy clothes for a trip because the clothes you wear are all perfect for travel. The time it takes to prepare for a weekend excursion or a trip to Europe will be minimal. For my last trip I bought a tiny purse with convenient outside pockets that are perfect for my cell phone, my iTouch, and my camera. When I came home I couldn't bear to go back to my huge, fashionable designer purse. I've been carrying the tiny purse ever since, and would love to find another one in a different color. I wear my favorite travel shoes every day. I have several styles by the same brand. They are Onex and I order them from zappos.com. I have the Christina in beige leather, the Bianca in straw, and the Candice in black. To see the Onex shoes, Click Here. I love the light and easy clothes from J. Jill. Their clothes are natural fabrics in soft colors. I have a J. Jill knit dress that can go anywhere and I also wear it all of the time at home. I can go through the J. Jill catalog and find all kinds of things that would be great for travel. For J. Jill online, Click Here. Ellie has bought wonderful clothes at Chico's. I used to think Chico's was for older ladies, but they have really changed and have a much younger clientele now. Ellie found a fabulous open weave, long cardigan sweater she wears to work as well as for travel. It goes over jeans or a little black dress. It is very light weight and totally changes the look of an outfit. Chico's even has a whole section of clothes that are wrinkle free called "Travelers." For Chico's, go to Chicos.com. Step Twelve: Share these steps with other Over Packers, and practice these principles in all of your travels. After experiencing the freedom and benefits of Carry On Only travel, my friend Ellie became a convert. She taught many of her friends how to "bundle." She threw away her big, bulky cosmetics case and started using zip lock bags. 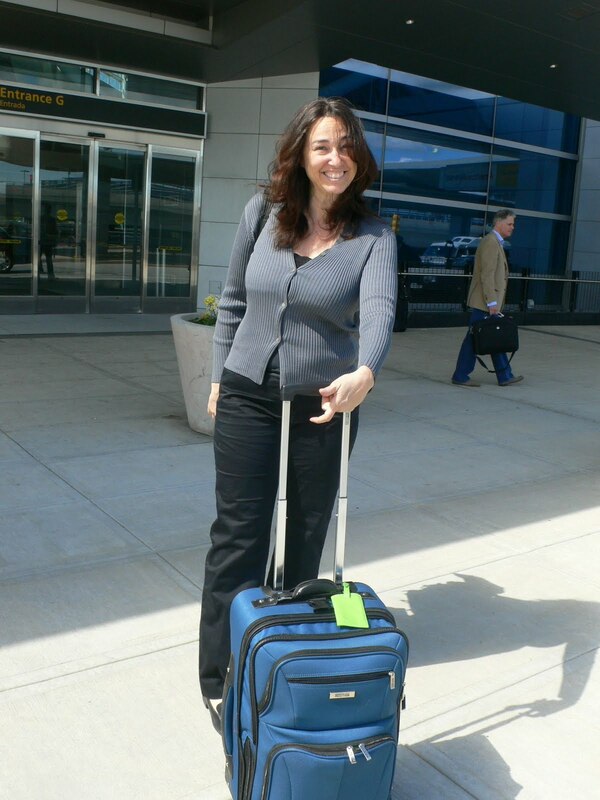 She bought a rolling carry on that is several inches smaller than the regulation size (22" x 14' x 9"), and loves being ready to go any where, any time. When planning a trip with her friend Terry, Ellie told her that Over Packing was not going to be tolerated on the trip. Ellie coached her through The Twelve Steps. They bundled. Terry is now a convert, too. Here is a picture of a very happy OPA traveler. Notice how happy she is now that she is only traveling with one carry on bag. Tons of great info! I always use zip lock bags. Next trip, I will try your packing tecnique. So well timed! Looking forward to a week in Italy via backpack! A week is nothing. You won’t have any problem! You have taught us well Annie. I can't imagine going anywhere, EVER, with checked bags. That idea stresses me out more than packing a carry on. We are going skiing in March and we have to check a bag with ski clothes and boots, but only 1 bag for 4 people and carry on for each. So much easier. Have an awesome time!